IMMIGRATION Minister Scott Morrison had a big win late on Thursday night, gaining enough crossbench support to ensure the Senate passed changes to asylum seeker laws, including measures to bolster the Government’s power to turn back boats. He had been working flat-out for more than a week to get the numbers, at one stage even pursuing Clive Palmer to a function at the US embassy to continue the arm-twisting that eventually got Palmer United Party senators on side. Wow, Scott Morrison twists arms! He negotiates! That is something to be celebrated, clearly. As is this method of “negotiation”? That Senate success was a rare high point for the Abbott Government in what was a shambolic end to a shambolic parliamentary year. “Success”! Yay, ScoMo. While the rest of the Government is a shambles, ScoMo can use children in detention as a bargaining chip for a slew of a mind bogglingly inhuman changes to Immigration law and procedures. It’s quite insensitive and superficial way to address such an issue – and frankly, no surprise. Neither is the rest, which is where we get into gossip column territory. Yet just hours later, when yesterday’s edition of Sydney’s Daily Telegraph hit the streets with a front-page report on suggestions Joe Hockey could be dumped as Treasurer, some of his Liberal colleagues were pointing the finger at Morrison as a likely source. News Corp journo discussing impact of News Corp front page talking to unnamed sources. Gossip. Finger pointing. Defending. Other Liberals had different suspicions about the exclusive by journalist Simon Benson. “Benson is well connected” is one of the more amusing lines in this piece – that could well be because Benson has been talking up the Liberal Party for as long as anyone can remember – he, along with Gemma Jones (remember her?) were their boosters in chief while they were in opposition. So it’s little wonder he’s “well connected”. And so it goes, we have “sources say” (but not senior sources, where are the senior sources?) this and other “sources say” that. Tony’s friends said that, Joe’s friends said something else. I’m not sure whether at this stage I’m reading a political analysis or a teacher’s account of a dispute between two former friends. No matter who spoke to Benson or what was their motivation, the importance of the incident lies in the disunity and paranoia it exposes and the lack of trust at the highest levels of the Government. There had been more evidence a day earlier when The Financial Review ran a story about a confrontation between Tony Abbott and Foreign Affairs Minister Julie Bishop. The paper claimed the minister had “gone bananas” at a meeting with Abbott over reports she was to be “chaperoned” at a climate change conference in Peru by Trade Minister Andrew Robb. Bishop was offended, according to the paper, because it was said the Prime Minister’s Office wanted the more sceptical Robb keeping an eye on her to ensure she did not overcommit Australia on climate change policy. Something is clearly amiss when details of a row between the PM and his deputy leader are leaked like this. Given that Bishop is popular among Coalition backbenchers and regarded as the Government’s best performer, it could only be damaging to Abbott. So many questions to be asked after this. Why would the bananas story be damaging to Abbott? Aren’t people allowed to be miffed at things? Did senior sources say that this was damaging? And Bishop is popular? Why wouldn’t a Liberal minister be “popular”? The superficiality of the pronouncements of this paragraph highlight the facile nature of such insider gossip stuff. All hints, all assertions and all in a tone of “I know all this because I’m an insider, so trust me, I know what I am talking about”. Keep in mind that these days “the Prime Minister’s Office” is almost always code for Abbott’s protective and controlling chief of staff, Peta Credlin. Credlin, like Hockey, is regarded by a growing number of Liberals as a problem that will have to be dealt with. Speculation about a possible Senate berth to get her out of her current role, though almost certainly groundless, indicates the concern. Ah, Peta Credlin. The scapegoat for the calamities of the most awkward Prime Minister since Billy McMahon. The Daily Tele and the like have been airing all sorts of stuff about Abbott’s Chief of Staff. The various rabid Labor Twitter shouters have also targetted her with various hypocritical sexist comments about her clothing choices and the like. The campaign against her has been whipped up so effectively that now the Tele has felt inclined to run a piece defending her. Such pieces are often seen as actually having the opposite effect and are the beginning of the end for people in politics. 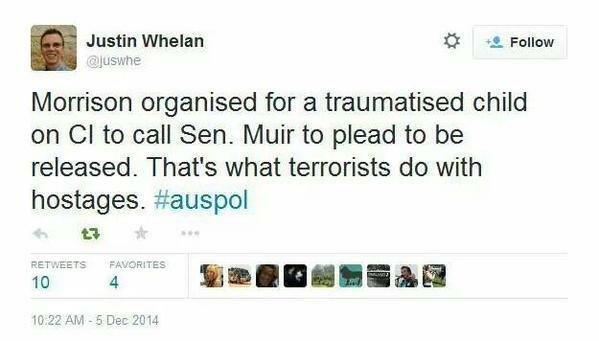 But Credlin should not be the focus on any of this stuff. A PM’s COS should be invisible, like Malcolm Tucker or Sir Humphrey Appleby. That she isn’t speaks volumes for media outlets and a government not wanting to admit that they have a dud performer in the PM’s chair. If Credlin left, nothing would improve. Indeed, there’s been precious little evidence provided in this commentary that Credlin isn’t actually very good and efficient at her job, no matter what people might think of the politics of the Liberal Government. Oakes’ sources however, aren’t really targetting Credlin this time. It’s Hockey. But Hockey is the subject of most of the talk. There is much to be said for getting rid of ministerial dead wood but, replacing the likes of Kevin Andrews and David Johnston may not be enough. “Very prominent” is the new “senior source”? And quoting someone who doesn’t like Hockey without knowing that person’s context and reasoning is pointless. The “very prominent” person may be someone who has never liked Hockey / is in a different faction / wants a better job. We don’t know because Oakes is just saying what he said. And the words being said do do damage to Hockey, because it hints at a wider view of Hockey. And that leads to an open discussion of gossip of what could happen in the future. And changing Joe is probably too hard — not only because the most obvious replacement, Malcolm Turnbull, would immediately be portrayed as a leadership threat to Abbott. To begin with, friends say, Hockey would not go quietly. It would be ugly. Also, giving a Treasurer the shove would be a big deal, effectively an admission that the Government’s economic policy has been on the wrong track from the start. On top of that, if Hockey has failed to produce the right Budget or to sell it properly, then the PM shares the blame. Gossip, gossip, gossip. This is all very well for Twitter, this kind of talk, but it’s not analysis nor any kind of serious political coverage. “Hockey would not go quietly”. Really? Thanks for that. Here, finally, we are getting some analysis and we have an admission that Abbott has issues – but inserted into this is another veiled dig at Credlin and her “command and control structure” – which has been the central charge from her detractors. “She’s too controlling!” If I was Abbott’s COS, I’d be controlling too, considering what happens when they say what they actually think. 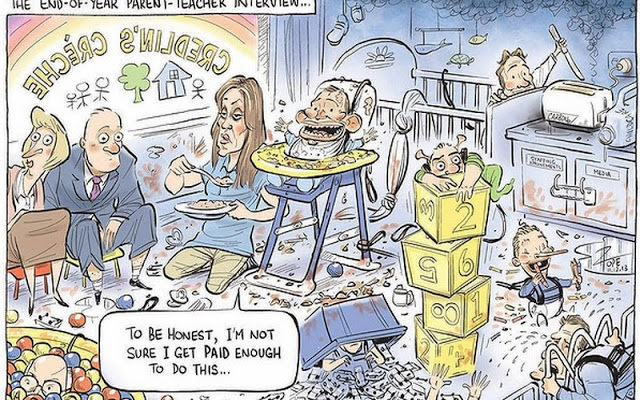 This David Pope cartoon sums up the Credlin situation perfectly. Whether Hockey will stay as Treasurer is undoubtedly a matter of interest. The question asked much more often, though, is whether Abbott can survive as PM. He answered that himself on Thursday when he remarked that “governments that change their leaders haven’t done very well lately”. Julia Gillard’s unhappy prime ministership, plus the Coalition’s defeat in Victoria after replacing a premier midterm, provide Abbott with insurance. This may well be true – and as an insider, Laurie would know such things for certain, we can glean. To end with Abbott as being the core problem is fair enough. But what is interesting is that along the way, we have seen Morrison, Bishop and Hockey mentioned. There’s a code here that I suspect is designed to spark discussion of leadership and the like amongst Liberal Government people, just as we saw with the ALP. In terms of these press gallery gossip columnists causing a stir within a government, they are back in the game. And they are relishing the possibilities of that all over again.